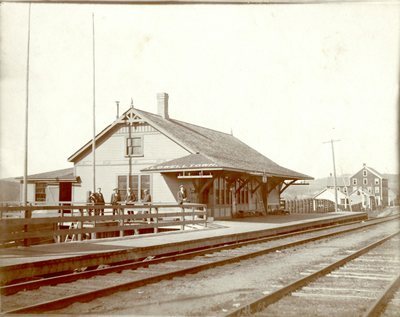 "Lowelltown, Maine, Train Depot "
A black and white photograph of the train station in Lowelltown, Maine, circa 1890. A handwritten note on the back reads, "From left to right, Customs Inspector, Deputy collector, Immigrant Inspector, Ticket Agent, and Telegraph Operator. (The baggageman has gone blue-berrying.)"